Looking for an AVI-to-MPEG converter? 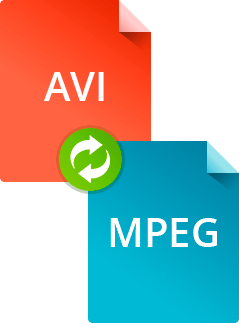 Are you looking for a stable AVI to MPEG video encoder? 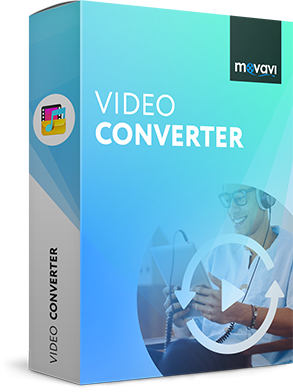 Download Movavi Video Converter and see how fast and easy converting from AVI to MPEG can be! Movavi Video Converter can be used in many different ways and for multiple tasks. 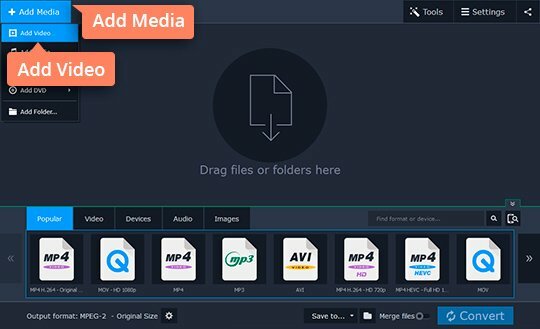 With the help of Video Converter, you can easily convert AVI to MPEG, MPEG to AVI, and many other audio and video format options. 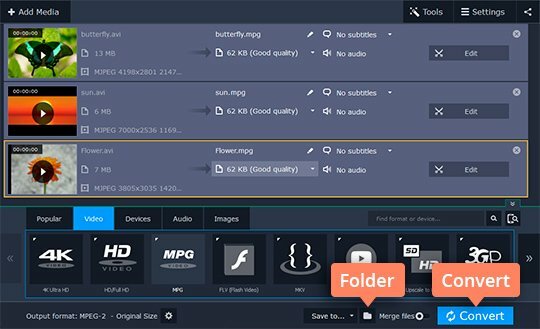 Just add your files to the program, choose from the 180+ output formats, and let Video Converter take care of the work. All you need to do is download the appropriate version and follow the guide below. Download the Video Converter program, open the downloaded file, and run the installation. Once setup is complete, the converter will open automatically. Click the Add Media button, then Add Video and select the AVI files you want to convert. Find MPG under the Video tab. Click this item to open the list of MPEG output options and choose the appropriate preset. 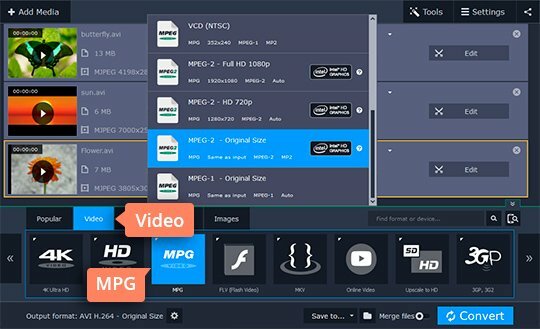 If you want to store the converted video on your PC or Mac, we recommend you choose MPEG-2. If you want to make a video CD, choose either VCD (Video CD) or SVCD (Super Video CD) with the appropriate TV standard (PAL or NTSC). If you plan on burning the videos to a DVD, use the DVD-Compatible Video presets to convert to a DVD-friendly MPEG-2 format. Before starting the conversion process, specify the folder where you want to save your newly created MPEG files. You can choose a path in the Save to field or click the Folder icon to select an existing folder. Next, hit the Convert button to run the conversion. Wait a few minutes for the format transfer to finish; you’ll see your MPEG files in the window that opens automatically once the process is done.